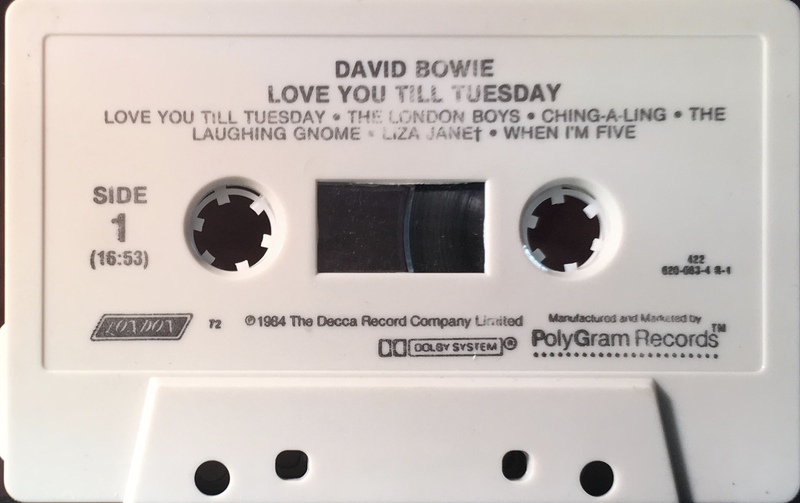 Love You Till Tuesday: USA; London, 820 083-4 R-1; 1984. 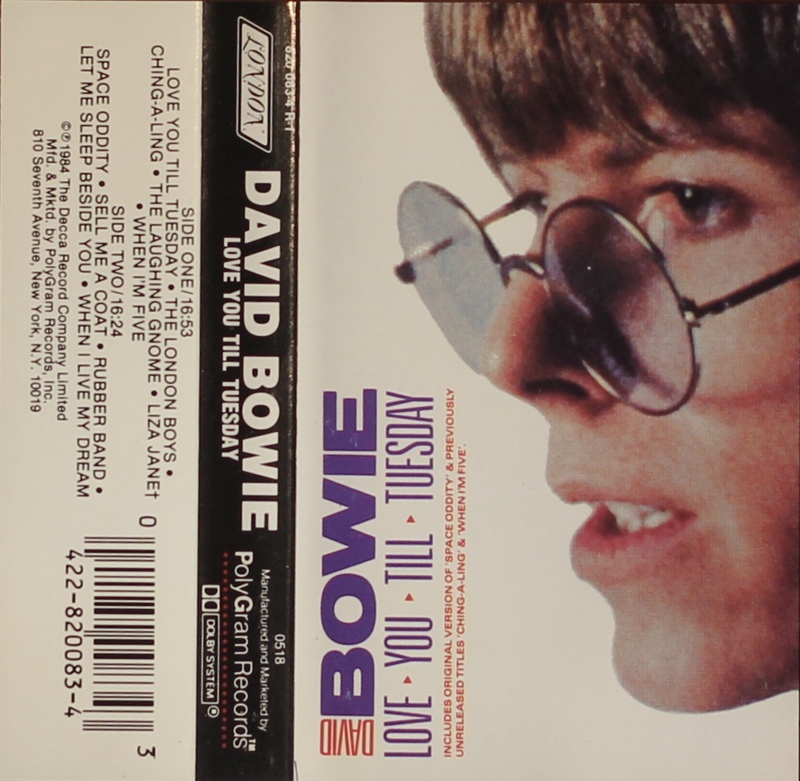 Full panel cover photo with black spine and white rear half-panel. 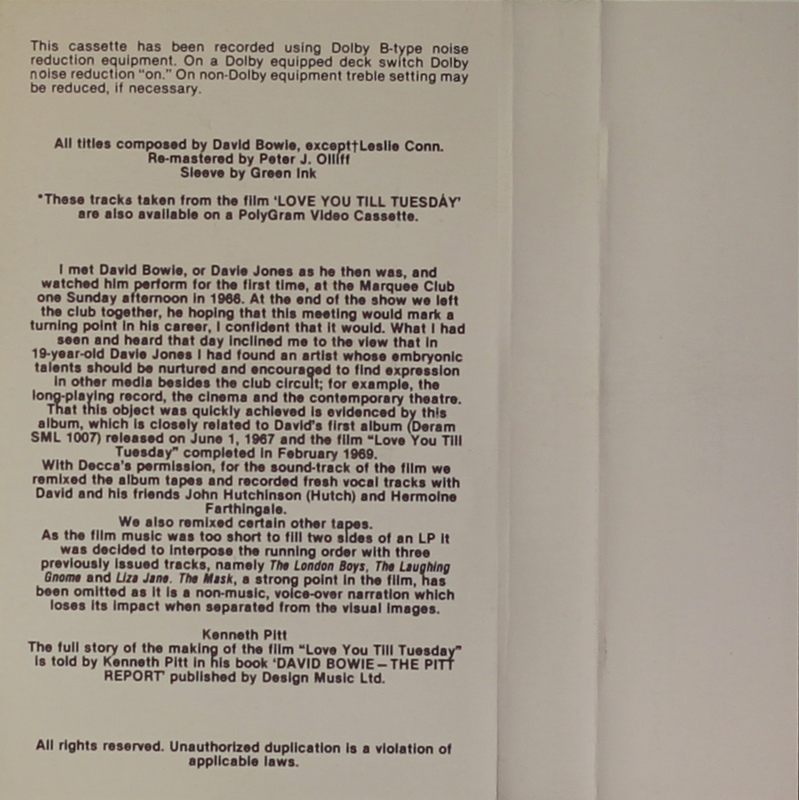 Folded, treated, light card with track list on the rear half-panels and introduction by Ken Pitt on the inside panels. On the spine is the number ‘0518’. Black ink printed directly onto grey shell. 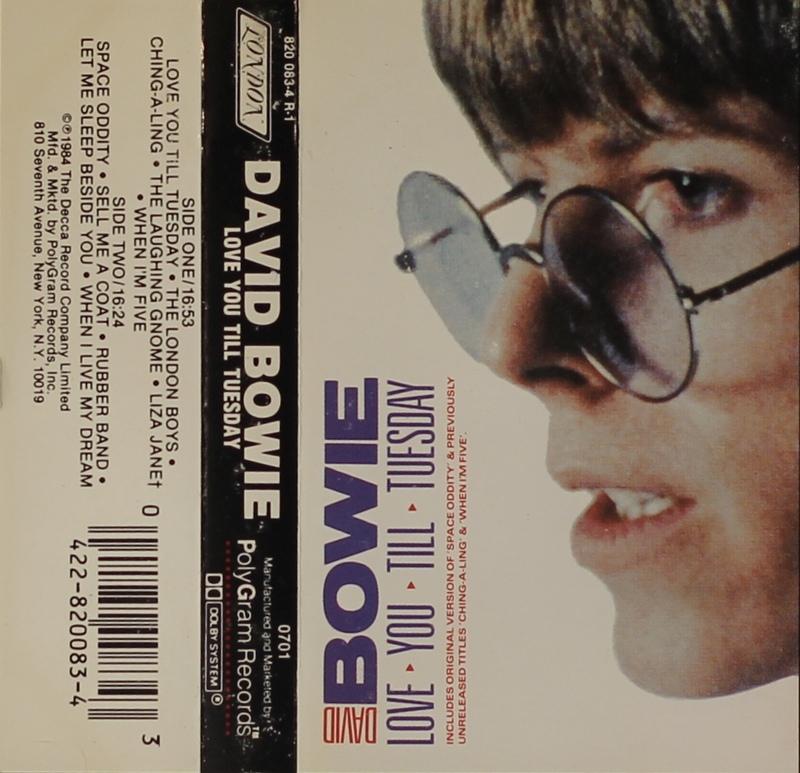 ‘London’ logo and ‘Manufactured and marketed by PolyGram Records. Shell variants exist. ’72’ after ‘London’ logo and 422 above the catalogue number. 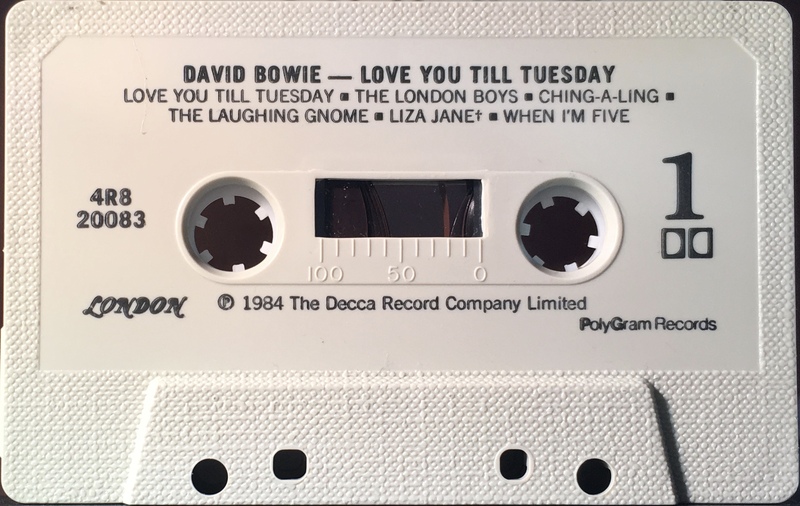 Side 1: Love You Till Tuesday; The London Boys; Ching-A-Ling; The Laughing Gnome; Liza Jane; When I Am Five. 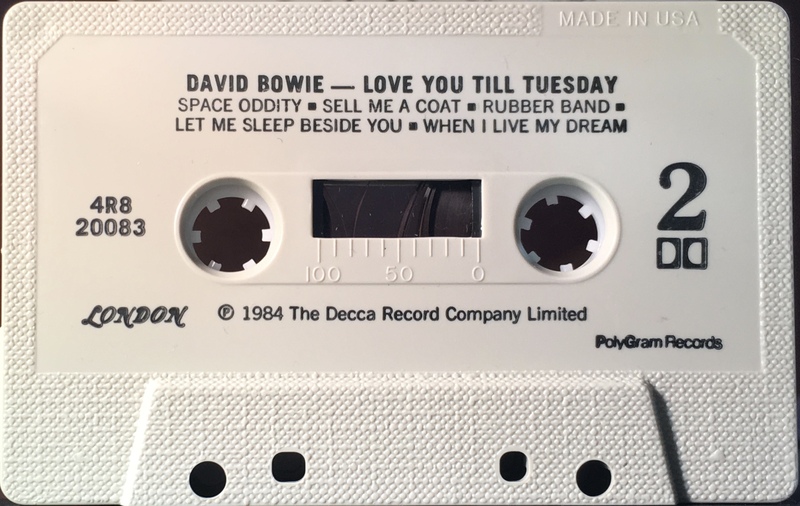 Side 2: Space Oddity; Sell Me A Coat; Rubber Band; Let Me Sleep Beside You; When I Live My Dream. Full panel cover photo with black spine and white rear half-panel. 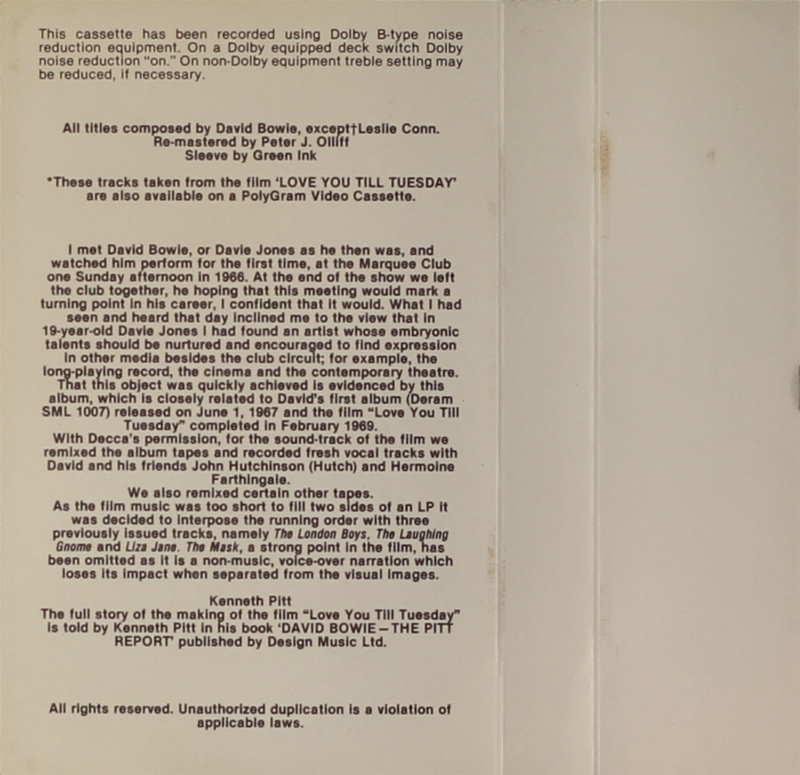 Folded, treated, light card with track list on the rear half-panels and introduction by Ken Pitt on the inside panels. 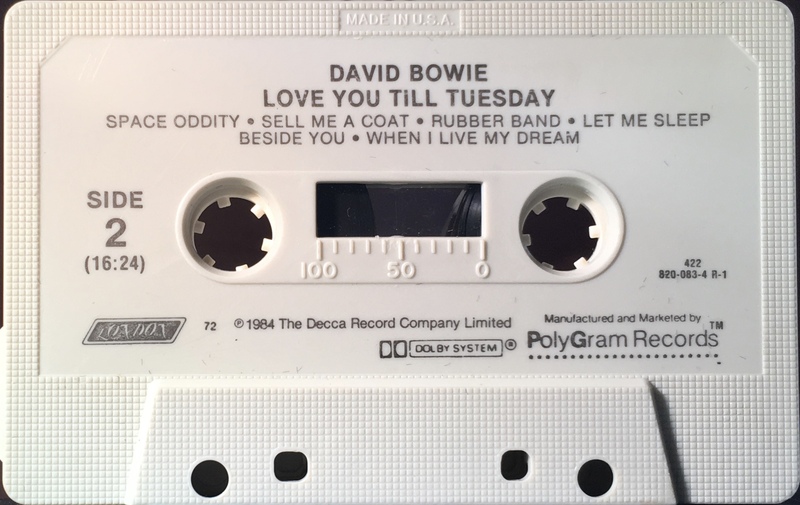 On the spine is the number ‘0701’. Black ink printed directly onto grey shell. 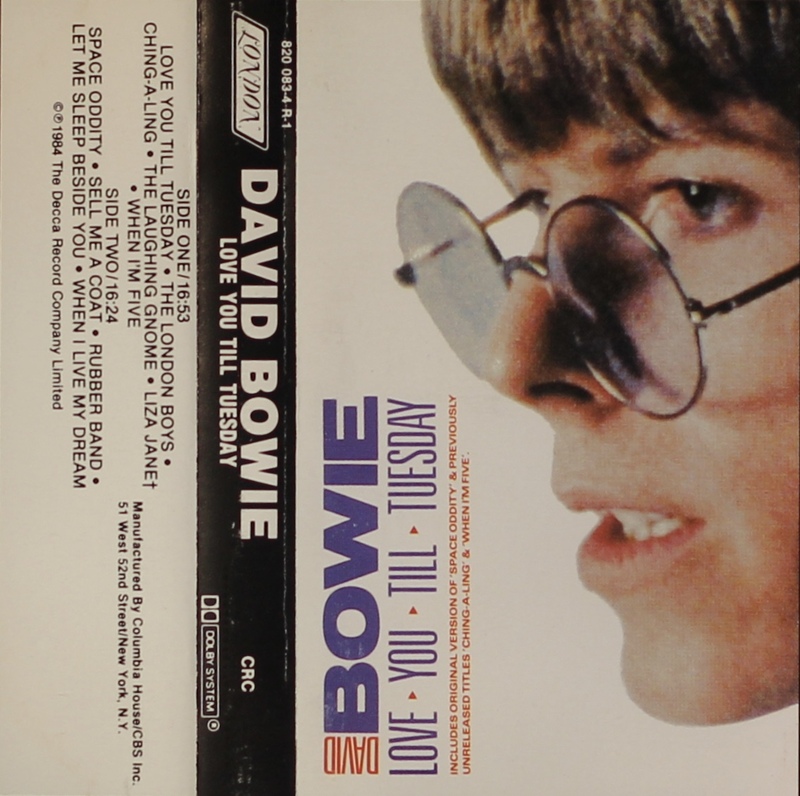 ‘London’ logo and ‘Manufactured and marketed by PolyGram Records. ’72’ after ‘London’ logo and 422 above the catalogue number. 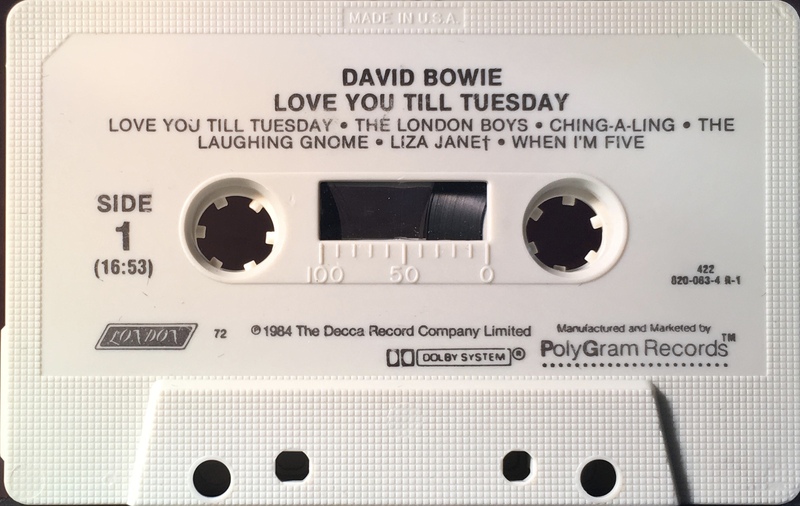 Love You Till Tuesday: USA; London, 4R8 20083; 1984. Full panel cover photo with black spine and white rear half-panel. 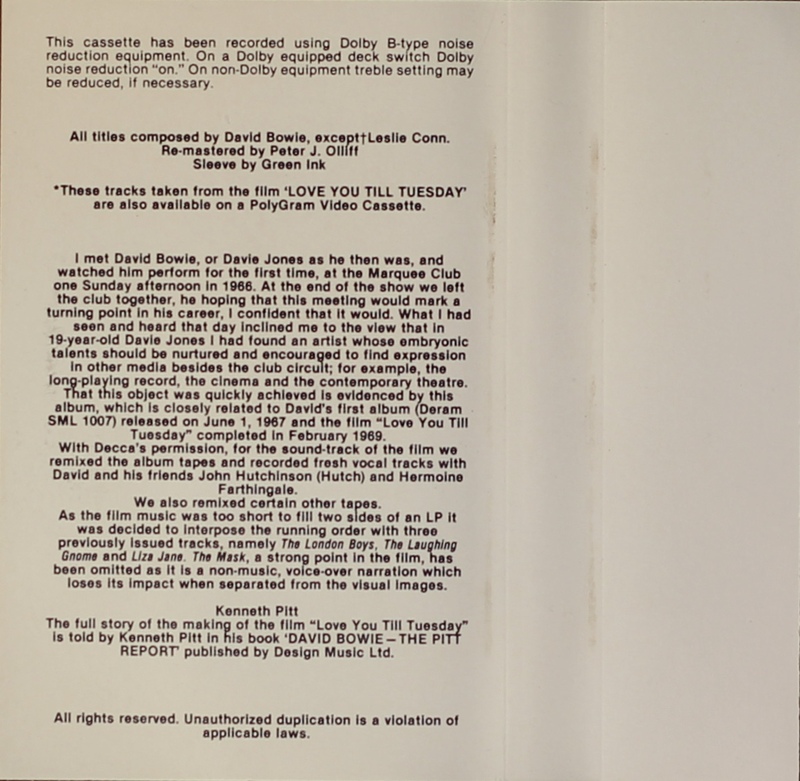 Folded, treated, light card with track list on the rear half-panels and introduction by Ken Pitt on the inside panels. 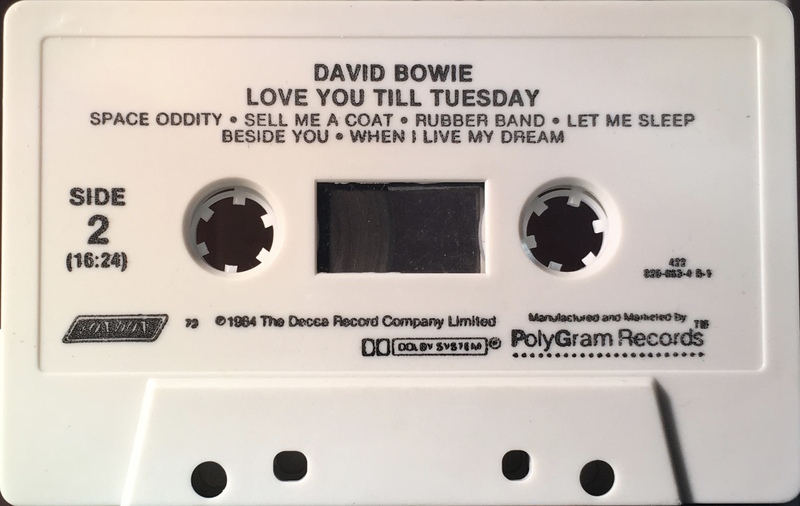 The spine has ‘CRC’ on it in place of ‘PolyGram Records’ and the rear half-panel has ‘Manufactured by Columbia House/ CBS Inc’.